A week ago, I decided to level up the plugins I was using here on BforBloggers, so I first chose to change my lead generation plugins to upgrade. After a couple of suggestions, I went to purchase Bloom by elegant themes and Thrive leads by Thrive Themes, both of them. I was quite skeptical about what to choose since there are a handful of these lead generation plugins but eventually, Thrive leads and Bloom are quite famous for their features and updates. Firstly, I bought a license for the Elegant Theme yearly membership priced at $89 giving me access to the Divi builder, Monarch and Bloom plugin and other plugins they have. The sharing buttons you currently see here is the result of using Monarch sharing plugin. Bloom, at the first impression, seemed to be a great beginner friendly tool to create email optin forms and casual lead forms and it has that typical Divi touch to it which almost every Elegant Theme’s product has so. At first, it may seem like Bloom requires Divi builder to build optin forms just like we have seen in Themify popup where their plugin required Themeify Builder to function. However, this was not the case with Bloom. I didn’t have to install Divi builder because Bloom is a stand-alone plugin that works with or without Divi builder. So, The moment I installed Bloom, I started to build my first optin form to launch my first campaign as there was no active optin form due to my recent switch to Genesis Framework. There was no exit intent trigger available! And seriously, It is the exit intent trigger that brought most of the subscribers to my list my previous campaigns, Look at this post where I shared the increase in conversion rate after using exit intent trigger. Anyways, I had invested my money in that, So I thought to go with the flow. I paired the category level trigger to show a specific optin form when a specific category is visited on my blog. That too was too damn hard to configure because in Bloom, when you select a category as a trigger, It takes the taxonomy class of WordPress and not the posts that are linked to it. That means if I assign an optin form to WordPress category, Bloom will show the form only when someone visits the WordPress category and not the posts in it. After a while, When I configured it with posts trigger along with the category trigger it worked as it should. Thrive leads, in the first look, looked more promising for business lead forms, webinar signup and super attractive optin forms with advanced triggers. I really loved the way they have created their dashboard. Management is easy in thrive leads. Creating an optin form with thrive leads is a little bit of a lengthy process because it has more options and customization levels. It includes way too more extra features as if I have a mini CRM with me. Moreover, its more advanced that Bloom in terms of optin formats, display settings, optin templates, triggers, sequences, and of course A/B split tests. Just like Bloom. Thrive leads too is a standalone plugin which doesn’t require thrive architect to be installed, and just a step further comes with it. Moreover, Thrive leads has more than 67 (as I counted) different optin forms, in different types. All of these are highly customizable so I’m sure you’ll get an optin form exactly the way you want. This will really help you build lead forms that can match your brand. Bloom was nowhere near to the thrive leads when we talk about customization. Also note, I did include an ethical bribe (lead magnet) that was interesting specific, a content upgrade and targeted audience on interest level making sure my optin forms could convert at the highest rate possible. This is the usual way I set up my campaigns. In total, I made 7 different campaigns with 5 different goals and targeting levels. I started all of my campaigns with Bloom & Thrive leads on August 1st and after 1 week, that is on 8th August I’m going to show you how they both compete with each other. The above image shows how exactly, optin forms I made with Bloom converted at the rate of 1.9% with more than 361 impressions. Interestingly, I got 7 new subscribers within 7 days after multilevel targeting and offering resource incentives. Now keep in mind I made sure my optin forms were shown to my visitors almost everytime they visit any page of mine. Bloom performed quite good. It’s really amazing to see a 5.7% of the conversion rate for my SEO targeted optin forms. Bottom line, I got 7 new subscribers in 7 days using Bloom. 7 leads for 361 targeted impressions is not so outstanding for sure, but it did the work. I’ll talk about this in detail later in this post. At first, I made 3 optin forms using Thrive leads. All with the same lead magnets that I used in Bloom. I made three forms that were triggered to exit intent. I used the screen filler type aka page takeover type of optin form in thrive leads about which I talked about in my previous post. The best part of thrive leads is exit intent comes with it. I made all of my screen filler lightbox popup forms to zoom in if someone tried to leave this blog. That’s what exit intent does. However, there’s one thing to note here is that I used A/B test with three of my optin forms. I talk about that in a minute. Surprised by the same numbers? Now even I don’t know how to react in this situation. Both of these lead generation plugins were active at the same time and surprisingly, both converted the same number of visitors in the same time frame. Thrive leads converted 7 visitors after getting more than 669 impressions. For calculating which plugin did best, we will have to look at the impressions made and the conversion rate of both of the plugins separately first then we’ll compare of them. Firstly, let’s look at the Thrive leads and the number of impressions its optin forms made. The report below is set for past 7 days. So, the total number of impressions thrive leads made was 669. For 7 days and 900+ users, it’s really great. But if you do the match then the average conversion rate of thrive leads is 1.3%. Also note that these optin forms where not visible to mobile visitors and my 8% of visitors are mobile phone users. In terms of creating impressions, thrive leads is outstanding. Total optin forms I made with Bloom plugin had only 371 impressions after 7 days of being live. That’s nearly half of the number of impressions Thrive leads. It’s in contrast to the theme and pretty attractive with that yellow color. This optin form was made to be shown everytime a visitor scrolls more than 50% on my posts. Keep in mind that all of my optin forms made through Bloom were visible to mobile phone users as well unlike thrive leads where I disabled it. Still, the forms only got 371 impressions, but what about the conversion rate? The conversion rate of Bloom optin forms is 1.9%. Even after getting half of the impressions thrive leads got, Bloom still converted more than 0.6% of my visitors. But how? It’s simple. Because the optin forms I made with Bloom were more attractive and sometimes, ugly. I painted them in complete orange, yellow, blue, and Green. I set the background color of my optin form’s to be solid orange and raised the contrast high. Along with that, I also made my call to action buttons solid green with high contrast. That way, the forms immediately attracted the attention of most of my visitors. 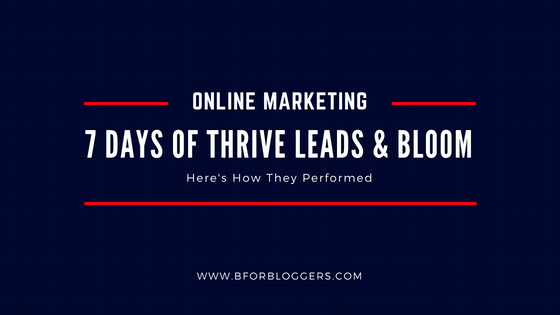 Its been a month since I first started to use thrive leads and Bloom simultaneously here on BforBloggers. Now I’m updating this post to show you what happened and which one performed well enough to be called a winner. With more than 1.4K views, the Bloom had a total conversion rate of 0.8%. Since every optin form is highly targeted and includes a lead magnet with it, I’m not impressed with this number. It could convert a lot better and I’ve also found that ugly forms that were high on contrast converted better than those beautiful forms. Just look at the conversion rate of affiliate popup, it’s great at 2.2%. This was how Bloom performed. What about thrive leads then? For the month of August, the total conversion rate was 1.05 %. This includes all the forms I made with thrive leads including the inline, content upgrades and click-on popups. With that number of optin forms and that too only with exit intent, thrive leads is completely outperforming Bloom. Bloom did quite great, at the end of the day, I understood Bloom was a beginner-friendly approach to beautify the lead generation and wasn’t a conversion focused plugin and it could not give me a better conversion rate and ROI (return on investment) on the price I paid for it. Thrive leads, on the other hand, is quite great with specs. The number of templates, their quality, layout, fonts and button shapes clearly defines how well it is made keeping conversion rate and ROI in mind. As predicted it outperformed Bloom in the longer run. If I will have to choose one, that would be thrive leads. Share this post and share your opinion in the comments section. What about convertplug (convertplus or pro)? I think it’s quite great plugin to get emails. I would see thrive leads vs convert pro plugin.